Tai Ping 1 Cash with the reverse side mirroring the obverse. Characters 太 平 天 国, "Tai Ping Tian Guo" [t,b,r,l] meaning "Heavenly Kingdom Sacred Currency". 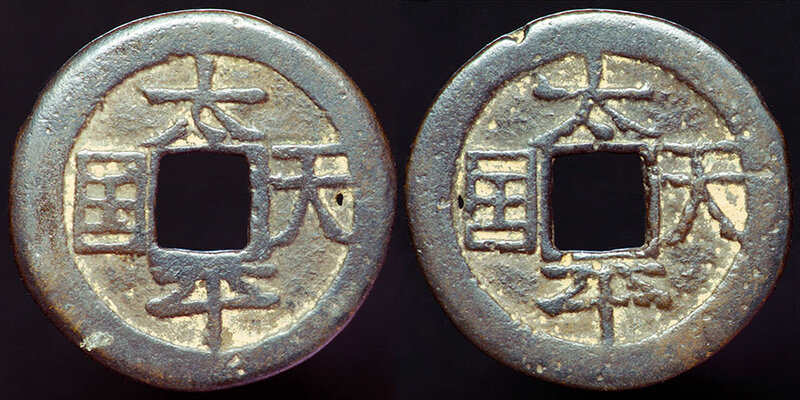 This exact type is listed in Ma & Ma "Encyclopedia of Tai Ping Currency" (T199 p. 90, 1994 ISBN 7-208-01864-2/K .416). This listing places this coin in the 'regular' TaiPing coinage section as opposed to fantasies and fakes, etc. in other sections. Unfortunately, even though there is a short paragraph describing this coin, I can not read Chinese. This coin is listed in a short sub-section of the book featuring only five coins and has a long paragraph about these 5 and a short one about each coin depicted in the rubbings. I would be thrilled to send somebody the three pages for a translation. This is cataloged in [ link ] as Coin # 186988; 3.46 g and 22.5 mm.